Gall Force - Eternal Story is a video game based on the anime of the same title, developed in 1986 (the same year as when Eternal Story was released) for the Family Computer Disk System. This game is the first commercial release by HAL Laboratory, creator of the popular Kirby series. It was also the only game developed around the Gall Force series. It was never released for play outside of Japan. Gall Force is a group of science fiction anime OAV series by the studio Artmic, with production by Youmex and AIC. The original character designs were by Kenichi Sonoda. In the original story line, an all-out, prehistoric galactic war rages between the all-female Solnoids and the amorphous Paranoids for too long. In the midst of battle, a plan which was secretly hatched by the leaders of both sides comes into fruition, and an unsuspecting crew of seven Solnoid soldiers aboard the Kulanis-class Cruiser named the Star Leaf is caught up in the middle. The Famicom Disk System game is a top down shooter and follows a different story than that of the OAVs. It features Rabby flying across Terra, and catapulting into six different regions of space in order to rescue each of her crew members one at a time. With each crew member that you rescue, you gain access to a new configuration for your ship. : Use the direction pad to control the Star Leaf, piloted by Rabby, in eight different directions. You can occupy most of the visible screen, but the screen scrolls automatically. : Press the A button to fire your current weapon. : Used to start a new game and to pause or unpause the action mid-game. : Press Select to cycle through the available crew members at the bottom of the screen. 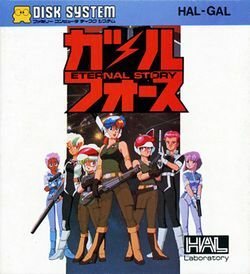 In Gall Force - Eternal Story, Rabby must pilot the Star Leaf and be catapulted to six different regions of space in order to rescue her crew mates. To do this, she starts by flying over the surface of Terra. After a while, she will encounter a collection of catapults with a number of dots on them. To be catapulted, all you must do is line your ship up with one of the catapults. At that time, your ship will reconfigure for high speed flight and you will be propelled into space. The number of dots indicate which crew member will be rescued, along with the relative difficulty of the particular region of space that you will be catapulted to. When you catapult, any damaged or missing compartments on either side of the nose cone will be restored. Initially, only three catapults will be available, but new catapults will be added as you clear earlier ones. You can revisit any region of space as many times as you like, but you will obviously only rescue a crew mate the first time you successfully clear the region. Alternatively, you may skip the catapult section entirely. If you avoid touching every catapult, the Terra stage will continue. There are three regions on Terra that repeat; a forest region, a water region, and a desert region. Once all six crew mates have been rescued, you must catapult to any region of space for the final confrontation. You will be required to defeat all six previous boss battle cruiser, plus a final seventh cruiser that you have never faced before. If you defeat this seventh cruiser, you will win the game. Power-ups are obtains by destroying ground structures. On occasion, a power-up tile may appear when a structure is destroyed. Some power-ups are more common to discover on Terra, while others are more commonly found in space. On Terra, it is possible to discover tiles hidden in the forest simply by firing your lasers over the trees. Level Up The Star Leaf can be leveled up to five different levels of power. These levels of power not only effect the offensive strength of the Star Leaf's regular weapon system, but also the strength of the configuration systems as well. When you begin a new game, you start at the first level of power. Collecting four of these power-ups will set you to full power. Full Power The Full power tile will not only automatically advance you to the highest level of power, regardless of your current level, it will also put the Star Leaf in a temporary MAX power configuration that is inaccessible by any other means. When this MAX power configuration wears off, you will return to the default configuration at power level five. For more information, see the Ship Modes section below. Crash Star Touch this tile to instantly destroy every enemy and bullet on the screen. Barrier Collect the Barrier to gain temporary invincibility. During this time, the Star Leaf will flash and be completely impervious to attacks by enemy craft and weapons. Speed Up Collect the Speed Up tile to improve the speed at which the Star Leaf moves across the screen. Like your power level, your speed resets to the lowest level when you lose a life. Fighter Stock After you have rescued crew mate Pony, you can summon her mech fighters to assist the Star Leaf by selecting her portrait and pressing . However, you must have enough fighter stocks in reserve to do this, or she will not appear. Collect this tile to increase the number of fighters that you have in stock by one. Slow Time If you touch the Slow Time tile, the movement of the enemies and their bullets will slow down to a degree. It's not enough to nullify their threat, but it is enough to make maneuvering around them a little easier. This power-up does not last very long. Extra Life Collect this to earn an extra Star Leaf ship to fight with. The central character and next in line after Eluza in the chain of command, Rabby is loyal to her shipmates above all other things. She pilots the Star Leaf, in a desperate attempt to rescue her six crew mates, who have been kidnapped by the Paranoids. The Star Leaf has a fair degree of defense, and a specialized system which offloads damage to the side compartments, or "wings," of the ship. When either compartment takes too much damage, the Star Leaf jettisons the compartment. When both compartments are lost, the central nose cone withstands all of the damage until the craft is destroyed. The offensive capability of certain configurations of the Star Leaf can be affected by the loss of a compartment. In its default mode, the Star Leaf fires a primary laser through the central nose cone. As the Star Leaf levels up, the laser strengthens until it is released as a fireball at the highest level. By collecting the Full Power tile, the Star Leaf is temporarily boosted to an overloaded MAX power mode. The Star Leaf opens all of its laser arrays, and fires them rapidly and automatically. You do not even need to press the fire button during MAX power mode. When the power-up is collected, all damage sustained by either compartment is restored. The Star Lead is not invincible during MAX power mode, and the compartments can sustain damage, causing one or both of the compartments to be lost. If one compartment is lost, the effectiveness of the laser arrays are cut in half. The shy and easily frightened computer expert of the crew, Pony gets along much better with artificial intelligences than she does with any of the organic crew members. Her closest friends are Catty and the ship's computer, OX-11. After being rescued by Ruby, she assists the Star Leaf by programming fighter mechs to fly alongside the Star Leaf and attack the enemy using basic combat strategies. Up to three can be employed at one time. Each one will behave slightly differently. The blue fighter flies back and forth along the same vertical height of the screen as the Star Leaf and fires upward. The red fighter hovers around the Star Leaf until it senses an eminent attack, and flies forward to engage the threat. The green fighter essentially travels all around the visible screen trying to contain peripheral threats. A follower, not a leader, Patty's distinguishing characteristic is her tendency to go into trance-like moments of distraction. Her Star Leaf configuration is to open all of the side array lasers, allowing the Star Leaf to fire laterally in both directions. This configuration is extremely weak offensively since it can't be used to destroy oncoming attacks, but it is extremely useful for discovering the locations of hidden power-up tiles. At full power, the arrays fire a wide burst of lasers that can clear multiple rows of structures extremely quickly. Naturally, the effectiveness of this configuration can be hampered by the loss of one compartment, limiting firepower to one side of the Star Leaf. The lose of both compartments extinguishes this configuration completely. Technically not even a member of the Star Leaf crew, Lufy crash-lands in a crippled Bain-class fighter just before the Star Leaf jumps into hyperspace. She is a cocky ace fighter pilot who pretends not to take dangerous situations seriously and does not follow orders very well. If she is aware that Rumy does not like her, she does not seem to care. Her Star Leaf configuration suits her personality very well. She has, by far, the most offensive configuration, opening all of the forward array lasers. At the lowest level, it only fires two lasers, one on either side of the nose cone. At full power it fires eight lasers in total, arranged far wider than the Star Leaf itself, and contains a lot of destructive power. Losing one of the compartments limits the laser fire to one side of the nose cone, which at full power is still fairly effective. Losing both compartments reverts the Star Leaf to Rabby's central laser. The eldest and highest ranking of the major characters. With the captain of the Star Leaf in a meeting on the fleet flagship, Eluza is the next highest officer and in temporary command when the Paranoids attack the fleet. Her Star Leaf configuration is the opposite of Lufy's, opening all rear laser arrays. This allows for a wide blast of lasers to be fired down at any enemies located below the Star Leaf. While this configuration is powerful, it is difficult to use effectively in dangerous situations, as most of the threat to the Star Leaf appears from the front. Like Lufy's configuration, the effectiveness of this configuration is cut in half if one compartment is lost, and returns to Rabby's central laser when both compartments are destroyed. The youngest of the shipmates, she is the least capable and hardened of the soldiers and fills in the anime mascot cliché role. Rabby acts as a big sister to her, scolding and shielding her. She dislikes Lufy. Her Star Leaf configuration is unique in that it does not open any of the laser arrays. Instead, it deploys a cannon over the central nose cone that rotates 360 degrees. It fires automatically, so pressing buttons isn't required. At each progressive level of power, the cannon fires more bullets and fires them more rapidly. Unfortunately, the game restricts the number of bullets that may be on the screen at one time. This configuration has questionable effectiveness. It cannot be relied upon in dangerous combat situations, but you may be surprised at how effective it can be while traveling through regions with relatively low numbers of enemies. You may not have to move the Star Leaf at all. It is also unaffected by the loss of either compartment. A soft-seeming and idealistic crew member, she is really an android copy created by the Solnoid intelligence chief, Catty Nebulart, to monitor the development of the "third race" - the Terrans. Catty is the last crew mate that Rabby can rescue. She does not provide the Star Leaf with an alternate configuration. Instead, it is believed that by having rescued her, she assists by improving the defensive capabilities of the Star Leaf, allowing it to endure more damage than it could without her. This benefit is always in effect, no matter which configuration you select. This page was last edited on 17 November 2013, at 04:25.